One year ago today I stood by the bedside of my dear friend Chuck Spacht as he longed for heaven. The time of his departure came late that Wednesday afternoon. He had fought the good fight, run his race, and finished his course. He lived well and he died well–for the glory of God! He gained heaven one year ago today. 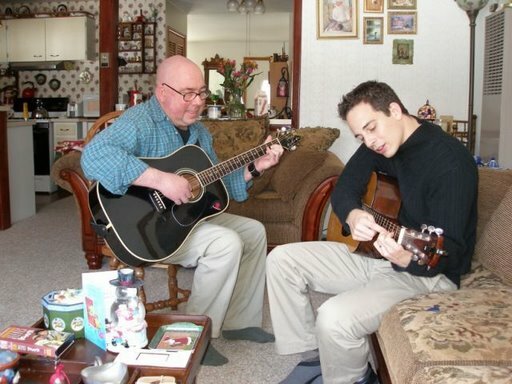 One year later I still miss him but thank God for the influence His life had on mine and so many others. We had some great times together watching various conferences, studying the Word, praying on Sunday mornings, and eating together (I am writing this at Chick-Fil-A–one of the last places Chuck and I ate together). His journals still speak to me. As I read them I can still see his smile, him writing a thought he wan’t to capture. As I have been preaching and studying from Philippians, I see Chuck’s imprint all over again–even as I re-read selections from his journal. He still speaks. Here are just a few insights into this man who affected so many lives with his joy in suffering. On Philippians 3:14: we bear down on the goal for the prize. The goal and the prize is to be like Jesus! If you are studying the Bible for anything else than studying Christ and becoming like Christ, you are missing the whole point. The bottom line of Christian living is to be a Spirit-filled believer who lets the Word about Christ dwell in him richly. He is the one who is progressing toward the goal–UNDERSTOOD? Lord, I am committed toward becoming more like Jesus. I see this as the one thing of my life. I look forward to becoming like Him when I meet Him. I recognize that I never will be like Him until then. There is no greater thing in my life that I need than the need to become like Jesus. All other aspects of Christian ministry flow from becoming like Jesus. Is heaven my primary preoccupation? Better to depart and be with Christ (Philippians 3:8). There is a surpassing greatness of knowing Jesus. When was the last time I trusted God for the impossible? Do I see my tumor, my “preaching the Word”, my sharing the gospel, as my being conformed to Christ? How many times have you thought of God and heaven in the last hour? How many times have you thought about yourself and things pertaining to this earth in the last hour? We miss you, Chuck! Enjoy glory today! We remember your family! They are all serving God and standing firm for the gospel! God is using your wife and your children for His gospel purposes as they strive to honor God and serve others. We are eager to see you again one day! Oh, what a day that will be when our Jesus we will see–along with those like you. “For I consider that the sufferings of this present time are not worth comparing with the glory that is to be revealed to us. For the creation waits with eager longing for the revealing of the sons of God.” (Romans 8:18-19, ESV). At midweek prayer this week I was given an article that Chuck Spacht, my dear friend and brother who is with the Lord, wrote on heaven. Along with it his wife gave me a CD Chuck had listened to on what happens when Christians die. Attached to a the CD was a sticky note with a question–based on Peter’s challenge. ” Blessed be the God and Father of our Lord Jesus Christ! According to his great mercy, he has caused us to be born again to a living hope through the resurrection of Jesus Christ from the dead, to an inheritance that is imperishable, undefiled, and unfading, kept in heaven for you, who by God’s power are being guarded through faith for a salvation ready to be revealed in the last time. In this you rejoice, though now for a little while, if necessary, you have been grieved by various trials,” (1 Peter 1:3-6, ESV). Amen, Chuck! Praise God, your joy is full and you are enjoying pleasures forevermore! 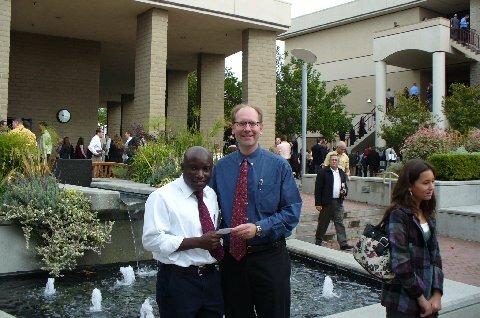 One of the highlights of my California trip was meeting Kwacha Simwaka, a seminary student at the Master’s College and presenting him with a check from the Chuck Spacht Truth Fund. Chuck, as many of you know, met His Lord recently, and his family established a fund in his honor. Kwacha was one of two seminary students who received monies from the fund for the purpose of building his library with solid books. Kwacha is from Malawi, a tiny country in Africa. He is the first student to come directly from Africa to the Master’s Seminary. Christ saved him when he was 17. He was discipled by a Master’s grad in Africa and attended some classes by Grace Community Church missionaries in South Africa. When he heard such teaching, he was so hungry for it because no such teaching existed in his country. He was highly recommended to the Master’s Seminary by his mentors and there was much planning to provide funding for a seminary education through his church over in Malawi and Grace Community Church. He started in September. Once he graduates from Master’s he plans to go back to Malawi and to teach faithful men that which he has learned. What a privilege to be the messenger of this generous gift from Chuck’s friends to Kwacha. And here are some really fascinating connections that developed in this whole story as it unfolded. Ray Mehringer at the Master’s Seminary was the one who helped me set up this meeting. Ray’s daughter-in-law (Monica) is the contact person my daughter Camille has out at Master’s College for her on-line classes. Camille got to meet Monica while out in CA. Kwacha recently lost a brother in death. [This brother was saved just days before he passed into eternity!] And now he has received this gift due to the death of another brother in Christ. Ray was part of a Master’s Seminary friendship banquet recently out in the Washington, D. C. area. Ryan, Chuck’s son, and his wife Danielle, also attended this banquet and actually ate at the same table as Ray. Ray didn’t know who Ryan is and Ryan didn’t know that Ray was instrumental in this whole project. But they had a great time together. And only when I was conversing recently with the two did I put this blessing of providence together. Kwacha is from Africa and will return to Africa. Joshua, another one of Chuck’s sons, is married to Carolyn, who lived in South Africa for years as her parents ministered there as missionaries. I love how God works all things together for our good and for His glory! One of the most influential books in all of recent Christian history was The Dairy of David Brainerd which Jonathan Edwards edited. David Brainerd died very young and spent the last few months of his life in the home of Jonathan Edwards. Edwards’ daughter Jerusha, whom Brainered loved and desired to marry, cared for David in his dying days. If Brainerd had not met Edwards, we may never have known of this great missionary and lover of God. But because they did, we have access to the rich jewels of Brainerd’s journal, which I commend to all. Earlier this year, a dear friend of mine named Chuck Spacht entered the presence of His Savior. He left behind several journals which I am only now being able to really sit down and contemplate. In memory of him, I am going to post at least one blog a week (for however long it takes) that will contain some thoughts he had in journal. I begin this week with some things he wrote down as we considering the teaching of Philippians 3:1-16. Though not all his entries may be dated, this one took place on October 31, 1998. My prayer is that for those who knew Chuck, this might remind us of his joyful perseverance in running the race that was set before him! He wanted us to share his desire to be with the Lord which is far better and to remember that God is good all the time! Though he be in glory, may these entries remind us that he still speaks. But more importantly may they help us in our race to run in a manner worthy of our upward call! Everyone needs to have the blessed dissatisfaction with their current spiritual condition. “The purpose for which we were saved [the glory of God] becomes the purpose for which we live.” MAKE A MAXIMUM EFFORT TO PRESS ON! Focus is important! What is your one thing? Focus is important for those who succeed in running correctly.